If you do a google search on how to make a sourdough starter, chances are you’ll find several different ways to do it. All of the different versions can even seem a bit overwhelming, especially if they have very detailed and complicated instructions about feeding. While instructions can be a good thing, following them exactly to the letter isn’t always the best idea. For one thing, if the process of feeding your starter is too complicated, you’ll probably be a lot less likely to actually bother with feeding it – which isn’t a good thing since regular feeding is important! The easier the process of feeding is, the more likely that it will actually happen. The most important reason not to rely exclusively on feeding instructions, though, is that every starter is different and will behave differently based on the region where you live, the climate, time of year, etc. Rather than focusing on feeding your starter using exact amounts of flour and water mentioned in a set of instructions, it’s better to go by the consistency and add flour and water until it “feels right” – just like our grandmothers and great-grandmothers would have done. This might be hard if you’re used to measuring everything exactly, but the problem with following instructions exactly is that the instructions might have been written by someone living on the other side of the country from where you live, and your sourdough starter may react differently from the one used in the instructions. As a general guideline, for feeding your starter you can add half a cup of flour and then add water until the starter reaches the consistency of a thick pancake batter. Depending on the season and temperature in your home, the amount of water can vary. * Note* The exception to this is if you are working with a sourdough starter culture that you purchased. If you’re working with a specific sourdough culture, like one from the San Fransisco area rather than capturing wild yeast from inside your own home, it would be best to follow the instructions that come with the sourdough culture since they are specifically designed for that particular culture. If your starter ever seems to develop a questionable “off” smell, it might be the flour you’re using to feed it. Rather than using a whole wheat flour, try using an organic, unbleached all-purpose flour instead. Sourdough starters need air to stay alive, so it’s best to keep your starter out on the counter of your kitchen or somewhere else where the air can circulate around it. If you close it up in a cupboard, it will be a lot less active, and it could even die completely. Depending on where you live, the climate and time of year, etc. you might find that your sourdough comes out a little more tangy and sour than you would like. One way to mellow out that sour taste a bit is to shorten the rising time of whatever you are baking. The longer the dough rises, the more sour tasting the final product tends to be. To get the full health benefits of sourdough, it’s best to let the dough ferment for longer, but if the sour flavor is too strong, you can experiment with shortening the rising time to get a flavor that is more agreeable. Another way to mask the sour flavor a bit is to add baking soda to the dough or batter. This method is mentioned in many 19th century cookbooks, and most recipes of the period that call for yeast advise bakers to add soda or saleratus is the yeast is too sour. From a health standpoint, it’s probably best to add the baking soda after the dough or batter has already fermented. I’m not a scientist, but since the sourdough creates an acidic environment that allows the dough to ferment (and reduces antinutrients like phytic acid), and since baking soda is alkaline, it seems like the baking soda would raise the ph of the dough, making it less acidic and negating some of the health benefits of sourdough baking. If you add the baking soda after the dough or batter has already fermented, though, you can have the best of both worlds. Adding baking soda after the fermentation time works best if you’re making something with a more liquid-like batter like pancakes or waffles because it’s much easier to stir in the baking soda completely so you don’t end up with bitter-tasting lumps of soda in the final product. If you’re making a loaf of bread or rolls or something else that has a really stiff dough, though, the only way to really do this would be to add the baking soda before the dough rises. In that case, you might not end up with quite as much of a “true” sourdough (and some of the health benefits of sourdough could potentially be compromised too), but it’s a really effective way to neutralize the sourness if you have an occasion where it’s really important for your bread to taste sweet rather than sour. Don’t Give Up if You Don’t Succeed! What would happen if I mix wild fermented, say, lentils batter into the recipe, instead of a wheat sourdough batter? It is still captured yeast, right? Or do different yeasts act on different grains or lentils? I ferment lentils all the time. So, this “sourdough” is less intimidating to me and I am most likely to bake if I can repurpose some of that… Please, please answer! Or direct me to someone who is differently knowledgeable from you… Gosh! There isn’t a “notify of follow up comments by email” button. I’ll come back :-). This is such a great blog!!! Really makes me hungry just reading and looking at the pictures : ) I recently baked my first loaf of bread and it was incredible!!! I used a starter my friend told me about. It’s from Sourdough’s International and now I have to spread the word! I loved it. Definitely going to order more when it comes the time. I am a new prepper. I got sucked into the idea that wheat properly stored will last for 30 years. I found a farmer friend that grows wheat and would sell me 5 gal buckets of wheat berrys for avoided cost. It turns out it is soft white wheat so many people stand in line to tell me that I can’t make bread out of it. I accepted the challenge when my wife bought me a manual flour mill for Christmas. Since then I have made a loaf of bread once a week. Some better than others but always eatable. I am getting quite dependable at my bread making and have a reasonable understanding of the impact of the many variables. The next step is to make my own yeast. Your site has me very interested. Do you have any experience doing what you have described using whole wheat flour (and maybe just a bit courser than store bought flour with all the wheat germ and bran). I’ve actually only used refined, all-purpose flour for feeding my sourdough starter. I’ve never tried using whole wheat flour, but I’ve heard from others that using whole wheat or freshly-ground flour can cause your starter to develop an “off” flavor and smell. I usually use store bought all-purpose flour for feeding my starter and my home-ground whole wheat flour for the bread batter or whatever it is I’m making. That’s awesome that you can get wheat berries straight from a farmer! I hope you yeast-making experiments turn out well! Shalom, and thank you for all this information! I’ve had such a good time looking through your website and the information I’ve found is a great teaching tool for my kids. Last week we started our science/health experiment making home made yeast and we’ve been taking pictures to document our progress- my kids are loving it!! We can’t wait to take our first bread loaf to our congregation as our first fruits bread offering. I just wanted to comment from a homeschooling mom’s point of view.. For us, baking bread is not just a fun thing to do, it’s home economics, math (measurements), science (chemical reaction that causes the bread to rise), health, reading (instructions), history (especially with all the historic details in your cook book, every recipe is a history lesson) and religious studies (grain offerings, leavened verses unleavened bread, First Fruits and the bread offering for Shavuot). There is so much to learn from baking bread, we’ve been doing it for the past few years, but this will be the first year we bake bread with our own home grown yeast. And what a perfect time to start!! We recently celebrated the Feast of Unleavened Bread, and now we are observing the Feast of Weeks that lead up to the double loaf wave offering for Shavuot (Pentacost). Anyway, I just wanted to share our experience with you. We are so excited to be able to make our own home made bread using our own home made ingredients. I’ve all ready spoken to other homeschooling mothers who are planning on making their own yeast as well with their children. Hello! I’m sorry for commenting on an old post, and I hope it still goes through to you! Last week, I tried making a homemade dried-yeast (potato, corn meal, regular dry yeast), and I must have killed it. So now I’m back and wanting to try the sourdough started. I’ve captured yeasts before, and I’m looking forward to trying it again! My question is – do you have any ideas about how much starter to use in a standard dry-yeast recipe? Of course, a lot will depend on the strength of the starter, but if it is kept at pancake-batter thickness and doubles reliably, is there an estimate for how much starter to use? I’d appreciate any info you may have! I love this whole yeast making thread! Thank you for sharing your research!! Good question! It’s hard to say exactly how much, but most recipes I’ve tried using sourdough yeast seem to call for about 1/2 cup of starter. It doesn’t always work as well to use sourdough starter in a recipe that calls for modern dry yeast, but 1/2 cups should be around the right amount. You might have to adjust the liquids a bit in the recipe, though, since the starter will add extra liquid to the dough or batter. I hope your yeast-making experiments go well! Hi, Mary. It would really depend on what type of recipe you’re using. This homemade yeast should work for any recipe that calls for sourdough yeast. When I make a loaf of bread, for example, I usually use about 1/2 cup of this homemade yeast (for one loaf and the recipe uses three cups of flour.) My recommendation, if it’s your first time baking with homemade yeast, is to find a sourdough recipe and use the amount of yeast called for in the recipe. Then, when you get more comfortable baking with homemade yeast, you can try adapting other recipes using this homemade yeast. Wow, great tips. Will give this a try. One question – when you transfer this to fridge, you will need to cover it right? else all the smell will cover the fridge. Also if you are not planning to use it for 2-3 weeks, is it okay to keep in the freezer? Hi, Amit. Yes, I would recommend covering the starter before putting it in the fridge. And it would be ok to keep it in the freezer if you wanted to, but you really don’t need to. 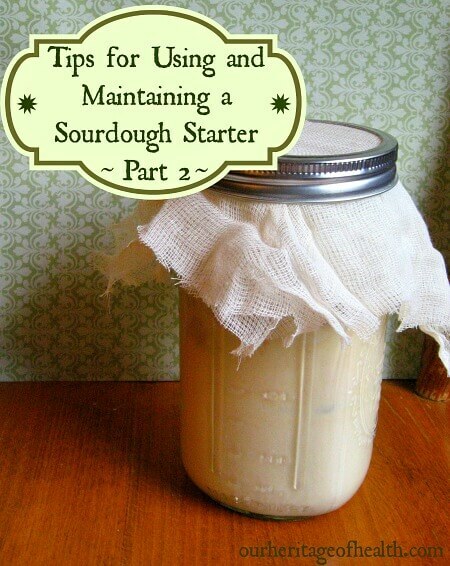 The sourdough starter can stay in the refrigerator for up to a month without needing to be fed, so for 2-3 weeks it would probably be easier to just keep it in the fridge. Hello! My question is, is this yeast something that is continuous? Like if I’m making a loaf or two of bread every week, would I continue to use the same jar/yeast forever? Or is it something I need to change out/start over every so often? I’m 100% new to homemade yeast, and break making in general. This will be my first time. Good question! Yes, this yeast is continuous, so you could keep using the same yeast over and over again. As long as you keep feeding it and using it for baking, it can keep going for years. I’ve been using the same batch of yeast for a couple of years now and it still works just fine. I do transfer the yeast to a clean jar every couple of weeks, though, because you’ll find that as the yeast rises in the jar, over time it can leave a crust around the rim of the jar where it dries out. But it’s the same batch of yeast just transferred over to a clean jar. I hope your yeast and break making turn out well for you, and good luck! I am loving creating my own starter. After four days it is ready to go and I am back at your sight to get the bread recipe to see what happens. Thank you for sharing your practical insight. I’m in the south but it has been very cold lately. I found the perfect place under my stove light and in the window(on a sunny day) to keep it warm and active. I’ll let you know how my very first loaf turns out. That’s exciting that you’ve got a starter active and ready to go, and I hope your first loaf turns out well! I’ve been working on my starter for a week following the instructions in Tartiness but my starter doesn’t rise at all! I’m feeding it daily and it gets the sour smell, what should I do differently? Just to check, are you using tap water to feed your starter with? If you are, then sometimes the chlorine that is added to tap water can keep the starter from rising. I usually use either spring water or filtered water for my starter. It’s also possible that you starter just didn’t catch the wild yeast in the air successfully this time. Most times a mix of flour and water will capture wild yeast and create a starter, but it can be a bit of a hit or miss process. Sometimes the first try doesn’t work and you have to start again with a fresh batch. Usually after the first couple of days you should be starting to see some bubbles or activity going on with your starter. You could also try feeding it twice daily just for the first day or two to see if that helps to jumpstart it. I live in Ayrshire in Scotland and got my first Sourdough Culture from Fiona Bird from the Outer Hebrides ,who has written books about seaweed cookery including seaweed Sourdough bread. Her starter culture had seaweed in it and I’ve kept it going for around 10 months now making a loaf every few days .My husband loves it and says it helps his digestion .I even took some to France last year in my suitcase and made several loaves on holiday! I add all sorts of flavours to mine from dried seaweed , herbs, garlic, sun dried tomatoes to sweet ingredients like banana , honey, dried fruit and cinnamon. I make mine with brown flour as it seems to rise better than with denser wholemeal flour . That’s really interesting! I’ve never heard of the idea of using seaweed like that before. And that’s such a good idea to take some of the starter with you to be able to make homemade bread even while you’re away from home. The flavors you add sound really delicious, too! I am so thankful that I found your post!!! I have spent hours researching on how to make natural yeast and bread. Have been so overwhelmed and have had several FAILED attempts!!! Most were so complicated and confusing for this simple Southern cook!!! Happily, I’m on my second day of your starter and looks like I’m growing yeast!!!! Bubbles already!!! Can’t wait to try your bread recipe!!! Thank you for putting it in simple words and making it easy!!!!!! Do you have to adjust your recipe any? Do you mean adjust the recipe for how I make the sourdough starter (the flour/water combination) or adjust my recipe when I’m baking with the sourdough starter? As far as recipes go, I usually use recipes that are designed for homemade yeast like a sourdough starter rather than trying to substitute sourdough starter for store bought yeast packets. If you’re willing to do a little bit of experimenting, you can try using a sourdough starter in the place of a store bought yeast packet in a recipe, but you might have to make some adujstments in the amount of liquids in the recipe since you usually need to use quite a bit of sourdough starter (about 1/2 a cup) to equal one yeast packet. Can recipes be adjusted for bread machine use? It would really depend on your bread machine. If your machine allows you to set the amount of time that the dough rises, then you probably could. Doughs that use a homemade sourdough yeast take much longer to rise than breads made with store bought yeast, so the rise settings for a lot of bread machines are much shorter than you would need for sourdough bread. But if your machine allows you to program the settings so that you can specify how long you want the bread to rise for, then you might be able to make it work. After baking with the sourdough and feedingthe remaining sourdough, can I use it the next day? Hi Helen 🙂 Yes, you should be able to use the sourdough starter the next day after feeding the remainder of it. As long as it looks active with plenty of air bubbles and as long as you have enough to use for your baking (with some leftover to feed for the next time) then you should be all set to bake with it. Thank you for sharing your knowledge. I’ll try, I believe I can.